I've been mostly out of commission the last couple of days, but it's been for a very important reason, and I'd like to talk to you about it. I had my first colonoscopy. My husband snapped this photo as I was having my IV removed following my colonoscopy. My policy toward IV's is simple: always look away. I turned 50 last year, so my physician recommended a screening colonoscopy. If you're 50 or older, I know your physician has recommended one to you, too. Have you had one? When I was a little girl, people would never have talked about "private" matters. For instance, no one said a lady was "pregnant"; she was "expecting a baby." I can't remember ever hearing the word "breast" uttered. When I grew up and entered the workforce, I found that my colleagues would never say that they were going to the restroom; they'd say "I need to run down the hall for a moment." To be honest, every now and then I miss some things about that scrupulously polite society. But there's one thing I'm really glad about. I'm grateful that we can now discuss what's good for our health, even if the topic of discussion involves private parts of our bodies. I'm grateful that breast cancer awareness has skyrocketed and women are encouraged to have mammograms. I'm grateful that women are getting regular Pap smears to screen for cervical cancer. And I'm really grateful that there's a method to screen for colon cancer. The topic of colon cancer hits close to home for me. My mother died very young--she was just 58 and my dad was 59 at the time of her death. God provided my father with a second wife, a wonderful woman whose husband had died. Theirs was a match made in heaven--but then she developed colon cancer that wasn't diagnosed until it was already Stage IV. Losing my lovely stepmother and watching my father go through the death of his wife a second time was excruciating. So although colon cancer doesn't run in my family, awareness of it certainly does. And yesterday I took the simple step of getting a colonoscopy to screen for any issues. I'll be completely truthful: preparing for a colonoscopy isn't fun. No two ways about it--completely flushing out your intestines isn't a pretty process. But I realize now that it isn't that big a deal. 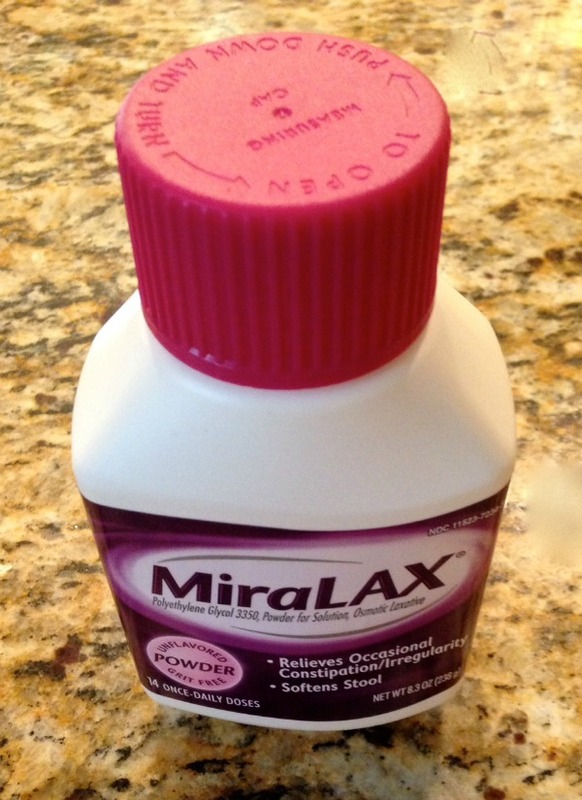 The primary product my doctor prescribed was MiraLax, which was very easy to take--it mixes easily with liquid and is odorless and tasteless. I simply mixed it with Gatorade. The most important part, I learned, is consuming lots of clear liquids, which is not too onerous a task. This plus a lot of Gatorade was my dinner the night before the procedure. As for the procedure itself, it couldn't be much easier. The only painful part was the small stick from having the IV put in. And it wasn't the least bit undignified. I'd say the greatest difficulty with having this procedure is the inconvenience. The preparation for it consumes a great deal of the day before the colonoscopy, and the procedure itself pretty much takes a full day, since the sedatives take a while to get out of your system. But the peace of mind that comes from having been screened for colon cancer was well worth a day and a half of my time. I am grateful that my test showed no polyps or other unusual results. I'll go back in 10 years and have another colonoscopy. I suspect I'd be even more grateful if there had been anything unusual, because it would have been found and treated before it became life-threatening. How about you? Have you had a mammogram? a Pap smear? a colonoscopy? Do you know anyone who has suffered from breast, cervical, ovarian, or colon cancer? Do you have a tip to share? Or would you prefer that we not talk about these "unmentionables"? Thanks for the this post Richella and yes my first one will be next year. It helps that you explained the process. I'm happy to see this post, Richella. I know many people avoid this because of anticipation of the unpleasant parts. I know this because my father avoided it until he was 72, only to have his first colonoscopy discover colon cancer instead of the polyps they may have found years/decades earlier. We're fortunate that his chemo/radiation/surgery were successful, but I can guarantee you that if he could rewind the clock and not have to go through that + more than 12 months with an ileostomy bag + surgery to construct a j-pouch and all the icky inconveniences that go along with those things and keep him close to home, he would. Hi Richella, I finally had my first one two yrs ago and it was so easy. Somehow that whole idea was so uncomfortable, but like you said the worst part was the prep. I also get papa and mammograms. Thanks for this important post. Athough we poked fun about it on facebook, I also know the importance of this screening and test. My mother was a colon cancer survivor...for nearly 20 years (she lived to almost 98) ..because they caught it early. Her mother died of it in her 60's. My oldest brother (almost 80) had it and is now considered cured as well! So...yes, it has had a strong presence in my family's history. I had a colonoscopy several years ago and I'm due for another soon. Thanks for sharing this post and bringing awareness to a necessary process that we all need to go through. By the way, you look simply lovely in your hospital gown...and I actually like watching them start my IV...lol! I go for mine every 3 years as I had lower GI issues earlier in my life, Colorectal cancer does run in both sides of my family ,so better safe than sorry. thanks for sharing this with your readers.. I hope they pay heed to your words, it could save their lives. I am dreading this in six years but will definitely do it. I get all my exams when needed because I am afraid of EVERYTHING. I am a breast cancer and a kidney cancer survivor --- yup - two completely unrelated cancers. So for my 50th year, I will not only run my first half marathon, I will be mamogrammed - scanned for stray renal cell carcinoma critters - and have a colonoscopy. Whoo Hoo - look out insurance claims. Fortunately the hysterectomy I had several years ago eliminates the pap smear and those scans check my ovaries as well. The prep for the renal cell scan is the most difficult - prep the day before and then 64 ounces of water the morning of and NO "running down the hall" before the first half of the scan. Worst of that - the office is across the rr tracks from the highway... misery. We are blessed to have a wonderful medical system and that diagnostic tests often find serious issues in well treatable time frames. Thank you for posting - this is not always an easy conversation, but our health is so very important. Well said Richella. I had one last year and you are correct in that the prep was the most inconvenient part since I did not even know that I was in the world during the actual procedure or afterwards for that matter. I was so out of it that my mother who was with me had to literally put my clothes on me so that they could wheel me out to the car! All of the anxiety and hype about this screening is so overdone and unnecessary! There is really nothing to it. I'm so glad you shared this, Richella, and so happy that yours turned out so positively. I finally had my first colonoscopy earlier this year, and I'm 65. I put it off out of fear, because my grandfather had one and during the proceedure, his colon was torn. He did not have any cancer but ended up with a bag secured to his abdomen. Even though I knew the procedure had come a long way since then, I just couldn't get that out of my head. I finally did it because I was having some digestive issues and ended up having an Endoscopy at the same time as the Colonoscopy -- kill two birds.....yadayadayada. The later showed some polyps (benign) & the Endo showed a few things that are now being treated with meds. It was kind of funny (if that's possible) when I was being prepped, my BP was well beyond "high," so I was quickly labeled as "THE HOT ONE!" I could hear the staff talking about "The Hot One" all over the prepping area. I was very relieved when the procedure was finished, & I woke up to the "no cancer" news. I now have to have a colonoscopy every 3 years, but that's pretty common for my age group. I'm so glad I finally overcame my fears & did this. Now I'm a big advocate for having the screening done early! I agree about IV's, or any needles for that matter, looking away is always best! 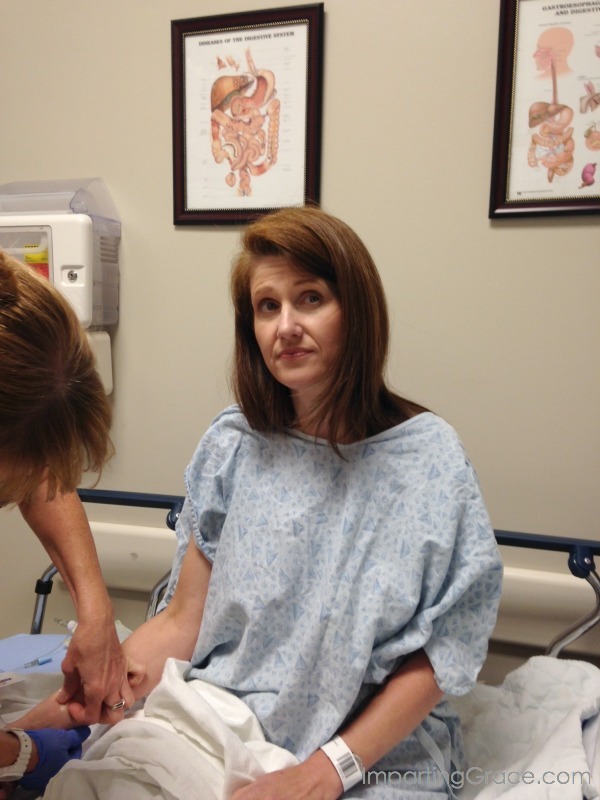 I had my first colonoscopy at 49 - I'd had a CT scan prior to my hysterectomy that showed some inflammation in the bowel area, so they ordered a colonoscopy. They found one small pre-cancerous polyp, which means I get to have another one next year. And, I'm the girl who said she'd never have one. My doctor made me do the old junk, never again. It will be MiraLax for the next one. I had the MiraLax prior to my hysterectomy and it was so much better - as you said, no taste - I mixed with 7-up and some with water. The other junk still makes me gag just to think about it and that was four years ago. As much as I dread doing another one, I will because it is part of being a good steward of my health. It is only by the grace of God that I did not end up with uterine cancer, as it had been a few years since I'd had a pap smear when they discovered pre-cancer and I had to have surgery. Had that not happened, I would not have had the colonoscopy, which means I would have ended up with colon cancer as well. Neither is in my family. It is definitely God's grace that put me in the right place at the right time, with top notch doctor's. I am grateful. Just getting caught up on your posts and, of course could not let this one pass without commenting. I had my first colonoscopy about a month ago and have to agree that it really wasn't bad AT ALL. The prep wasn't terrible, I don't remember the procedure (or the four hours following it! ), and like someone said above, I kind of liked the "lighter" feeling afterwards. I actually had so much energy the following day, I couldn't believe it! And, best of all, the feeling of knowing everything was just fine was such an incredible relief. I've had colon issues in the past and had surgery seven years ago to have 18" of my colon removed. To say I was terrified to have a colonoscopy was an understatement. On another note, my husband had his colonoscopy about six months before I did and they did find polyps. I am so incredibly grateful that he did this and that they found what could have been a problem but were able to take care of it. He'll go back in three years and have them keep an eye on everything. I want him to be around for a long time, so I'm so thankful for this procedure. Thank you, thank you for this post. Colon cancer runs in my family. I am supposed to be seeing a gastro doc soon for digestive issues. I am sure he will recommend I have this done. I am terrified. I am such a modest person. Thank you for saying there is nothing undignified about this procedure. I needed that. May I add...you are simply lovely...even when looking away from an IV! Which is always my policy too.